I had almost forgotten the significance of 29th May this year, until I read a post on Rohantime reminding me that 63 years ago Edmund Hillary and Norgay Tenzing became the first people to climb Mount Everest. This was just under a month before I was born, so a bit soon for ‘ where were you when’ memories. Mike Parsons, on the other hand, remembered being on a Lake District camp site with his parents when the news came through and in many ways it helped shape his outdoor career. Everest 1953 encouraged outdoor education in the 1960s which provided a key market for Mike’s early Karrimor rucksacks and Chris Bonington’s big wall expeditions to Annapurna and Everest in the 1970s catapulted his suppliers, including Karrimor, to international prominence. Much later Harriet Tuckey’s riveting biography of Griffith Pugh gripped both of us for its insights into equipping the expedition, its nutrition, food packaging, hydration, acclimatization and use of oxygen. 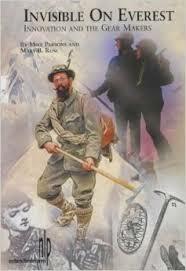 Pugh was undoubtedly the unsung hero and deserves considerable credit for the expedition’s success. We both suspected that there had been an ‘invisible hand’ behind Everest 1953, now we knew who it was and what impact he had had. His legacy influenced our most recent project, understanding Keeping Dry and Staying Warm. ‘ With the two of us working together we could produce something superb, I feel it is the chance of a lifetime and we have genuinely complementary skills. I so want it to work’. The journey began 4 months earlier in the January and led to so many exciting developments that went far beyond the book through Mallory replication, conferences, courses and workshops. The next blog will take you through the next stage of the journey. Thanks Sarah Howcroft and Rohantime for jogging my thought patterns for this blog!